Fujitsu today announced that it has systematized the services that offer total support-from planning to design, implementation, operation, and usage promotion-for communication platforms(1) that change the ways customers work. Available in Japan from today, the services will be provided under the name FUJITSU Enterprise Application Digital Global Communication Service. In order to quickly respond to the increasing diversification in the ways people work, in 2015 Fujitsu consolidated its communication platform for its approximate 160,000 employees around the globe. This year it began migration of the platform to a multi-cloud environment, in order to be able to continually apply the latest cutting-edge technologies. Based on the experience Fujitsu gained from this internal implementation, such as the issues that were raised in the process and the methods used to resolve them, this new service offers total support for everything from planning the transformation of how people work to implementing and operating a communication platform, and promoting its usage. Customers who use the service can rapidly implement the optimal communication platform for their business. The process from planning to communication platform deployment can be completed in as little as three months. Fujitsu will continue to provide communication platform services with global support going forward, while aiming to expand related services. The Japanese Ministry of Internal Affairs and Communications is promoting reforms to the ways people work, with the goal of resolving issues in society, such as the declining birthrate, the aging population, and crisis management during disasters. Fujitsu has contributed to transforming the ways people work by providing communication platforms to customers representing about 1.5 million people, using the knowledge and experienced gained in implementing a communication platform internally. In implementing communication platforms for companies, there is an accelerating trend to migrate from existing on-premises systems to systems in multi-cloud environments, which combine cloud services provided by a variety of vendors. As part of this trend, Fujitsu itself this year decided to adopt a communication platform in a multi-cloud environment that combines services such as Microsoft's Office 365 integrated information sharing cloud service and Azure Active Directory Premium cloud authentication platform, the VMware AirWatch® mobile device management service, and Box's content management platform, with global migration currently ongoing. This service provides total support for everything from planning the transformation in how the customer works, to designing, implementing and operating a highly secure and stable communication platform optimized to achieve that transformation quickly, and even entrenching the system within the company and promoting its usage. 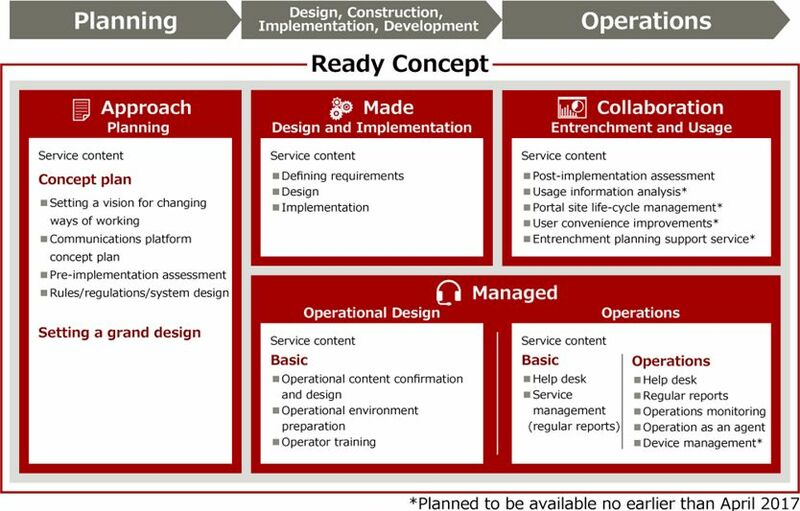 In order to quickly create the customer's communication platform, Fujitsu offers this service based on a "Ready Concept," in which a series of processes are grouped into models for each phase, based on the knowledge and experience gained from implementing Fujitsu's internal global communication platform, as well as implementing platforms for customers representing 1.5 million people. Using the design approach method(2) , this service supports the establishment of a concept of how the customers want to transform the ways they work, and the basic design of a communications platform. It also provides support for issues such as the establishment of policies dealing with legal regulations outside Japan, which must be considered when implementing a global communication platform. In addition, the service supports the evaluation of the potential return on investment from implementing a communications platform. This service completes the system design and implementation of a highly stable communication platform, based on the concept established in the planning phase, in half the time of previous methods, using system design templates prepared in advance. To enable the users and system administrators of the communication platform to use and manage the system without keeping in mind the individual services in the multi-cloud environment, this service offers options such as system operation by an agent and help desk services. For the help desk services, support is offered in multiple languages, including Japanese, English and Chinese. This service will quantitatively and qualitatively evaluate the usage status of the communication platform post-implementation, and offer support and proposals to promote usage suited for each user department's level of activity. Comment from Toru Fukushima, Managing Executive Officer, General Manager, Enterprise and Partner Group, Microsoft Japan Co., Ltd.
"Through the strategic partnership between Microsoft Japan Co., Ltd. and Fujitsu Limited, we have promoted the implementation of multi-cloud solutions that transform the ways people work, especially with Office 365 and Azure ADP, which have been well received by numerous customers. In September this year, we jointly announced the enhancement of this partnership to accelerate the digital transformation of customers. I now enthusiastically welcome Fujitsu Limited's launch of the Digital Global Communication Service, providing the rich experience Fujitsu gained from its global-scale internal implementation, and implementing Office 365, Azure ADP, and Enterprise Mobility + Security for customers, supporting their rapid implementation and usage by an even broader range of customers." Comment from Jon Robertson, President, VMware K.K. 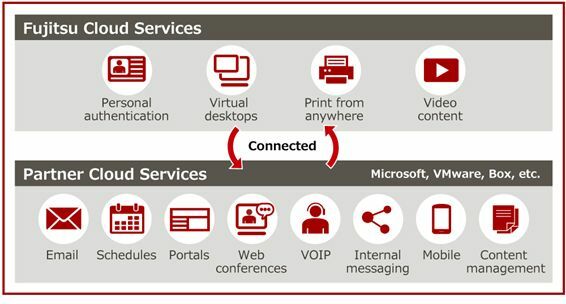 "With the increasing demand for high-performing business solutions that enable working-on-the-go in Japan, Fujitsu's 'Digital Global Communication Service' enterprise mobility application, powered by VMware AirWatch®, enables comprehensive mobile management under a unified platform, providing a consumer-simple, enterprise-secure experience across all end-user devices. We look forward to further collaboration with Fujitsu to deliver a truly 'Digital Workspace' vision, enabling our mutual Japanese customers to work from anywhere, any time and on any device." Cumulative sales of 150.0 billion yen by the end of fiscal 2018 for all communication platform services, including the Digital Global Communication Platform Service. A communication platform including systems such as ID authentication, email, portal sites, document management, web conferences, telephones, messaging, and video. An approach that establishes concrete policies through relevant personnel gathering to share ideas and describe the future shape of the issue (vision), and studying and evaluating issues such as the specific ways of working to achieve that vision, and ways to employ solutions.